Everyone at Apple Farm Service was excited to learn that the big man in red is stopping by each Apple Farm Service location to fill up on his farm toys! To celebrate, Apple Farm Service is turning their showrooms into Santa’s workshop! Children and their families are invited for a morning of fun with Santa. Get a free printed photo with Santa, warm yourself with fresh hot chocolate or hot apple cider, create your own homemade Christmas Tree ornament, and enter the toy raffle! This fun and festive event is free and open to the whole public! Bring the entire family to tell Santa your Christmas wish list, or get gift ideas while viewing Apple Farm Service’s extensive selection of toys and apparel. 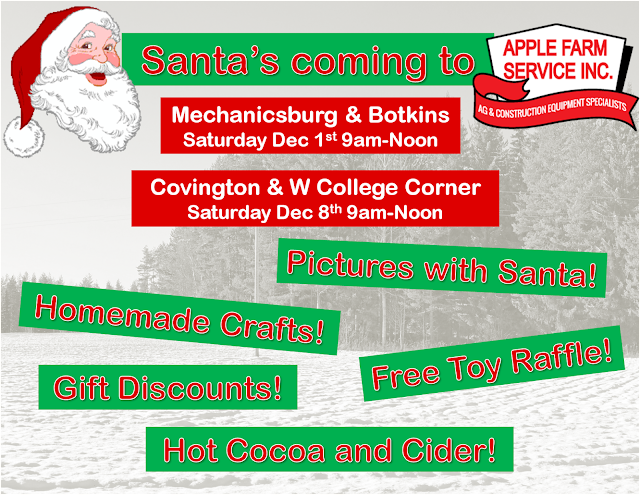 Santa will be at our Botkins and Mechanicsburg locations on Saturday, December 1st, from 9AM till noon, and our Covington and West College Corner locations on Saturday, December 8th, from 9AM till noon. Want to learn more about Santa’s visit? Go to AppleFarmService.com/Santa to view this year’s craft, Santa displays from last year, this year’s toy raffle, and our current selection of toys and apparel!